donated. Hundreds attended, many brought their vintage cars, tractors, lorries…. and a traction engine which added to the atmosphere, with lots of stalls and great music. Mitre would like to thank Mervyn and his wife Sharon…..
also every member of the Car Club and supporters for all their hard work and organisation. 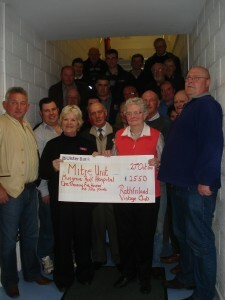 The Latharna Club Raised an amazing £1,750.